Peter Georgescu’s books cover a diverse range of topics from leadership to income inequality, but are tied together through a shared narrative of the virtues of being good and doing good as critical ingredients to success in business and life. Sign up and get the free book excerpt for The Source of Success! Almost there! Please enter your email and click the button below to get the free excerpt. Creative capacity and the brand integrity that grows from it are an organization’s most important assets. Enlightened leaders inspire creativity through understanding, cooperation, and respect. Competence and execution are as important as ever, but they must be aimed at building intimacy with the customer. Alignment is the critical concept for the twenty-first-century organization. Great companies don’t happen without leaders who have transformed themselves. Filled with stories taken from his own life experience–both his early personal experiences and his professional view working inside the most powerful companies and brands in the world–this book is rich on many levels. When Peter Georgescu speaks of the principles essential to success, he means principles, not motivational tools or management gimmicks. The Source of Success is fundamentally about developing the character and the wisdom you need to prevail in a highly competitive world. This is an essential book for today’s business leaders—and tomorrow’s. 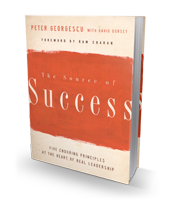 Peter Georgescu gives us all a lot to talk about in The Source of Success. He tells us what’s essential for business success and then shows us how to attain it. The core of this values-based business book is the belief that to be a business success you must be a good person. In a time of corporate scandal, his message has never been more right. A great read. In The Source of Success, Peter Georgescu tackles two issues that have special resonance in today’s business world: creativity and integrity. At the intersection of the two stands the type of enlightened business leader we need in the twenty-first century. Peter shares important insights forged through a remarkable career—and fascinating life story.